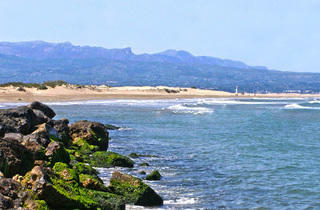 The Platja del Fangar is an extensive strip of sand that is closed off to the north by the Ebre Delta. The Fangar peninsula stretches and curves as it goes along, to the point that it forms a large enclosure of salt water, creating an interior sea known as the Port of Fangar. 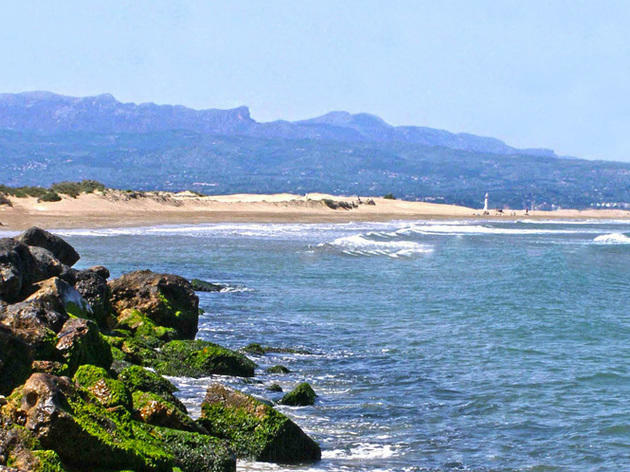 The beach, semi-desert and pristine in appearance, is one of the most unique places in the Ebre Delta. The sand is ultra fine, and when it meets up with water it turns into a compact mass, perhaps earning Fangar ('mud' in Catalan) its name. This giant sandbox has an area of more than 400 hectares, and the beach stretches around 7 kilometres long. You can travel along it by car or bike; however, at certain times of the year the central area of the peninsula is blocked off to protect the nesting area of terns and gulls. The red-and-white lighthouse is the only element that breaks up the beach landscape and provides a point of reference. The swimming area that surrounds it is spectacular. If you start seeing things when the sun is strong, like vehicles or buildings over the water, don't rush yourself to Red Cross – the peninsula is famous for mirages, caused by the effects of the water and the heat. It's common to find fishermen at work on a boat or on foot. Taking advantage of the richness of the waters, several mussel rafts have been installed, which can be visited via kayak excursions. The Platja del Fangar has no available services, and you won't find natural or rentable protection from the sun or wind, so don't forget to carry everything you need for a beach day, from food and drink to umbrellas and sunscreen. Getting there: Take the A-7 to exit 39A in L'Ampolla, and keep going until Deltebre, where you'll carry on via the TV-3451, which will take you to the Platja de la Marquesa and then to the Platja del Fangar.